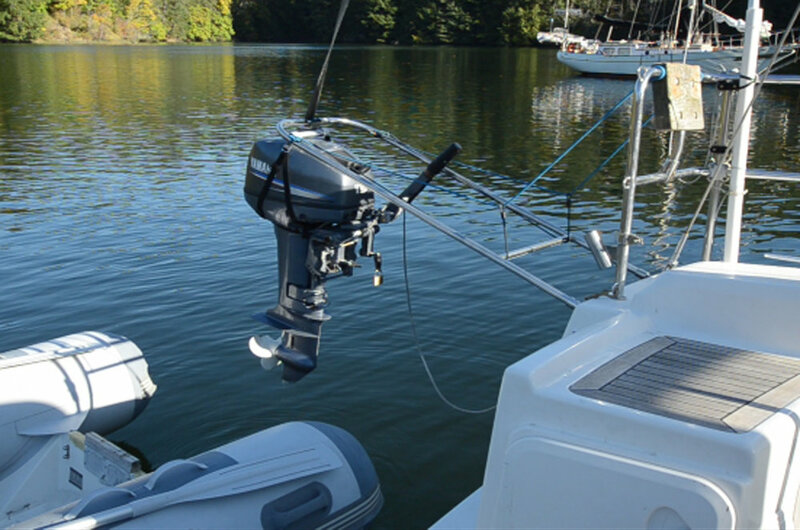 Swing-Lift uses an existing halyard to transport your outboard motor safely and effortlessly between the railing and dinghy. Swing-Lift began as one sailor's solution to a common yachting problem: How to move a heavy outboard motor from the tender to the yacht without having to add a bulky and expensive hoist. Swing-Lift makes use of the boat's existing winch with a halyard or topping lift and controls the position and orientation of the outboard so that it can be moved effortlessly and single-handedly. 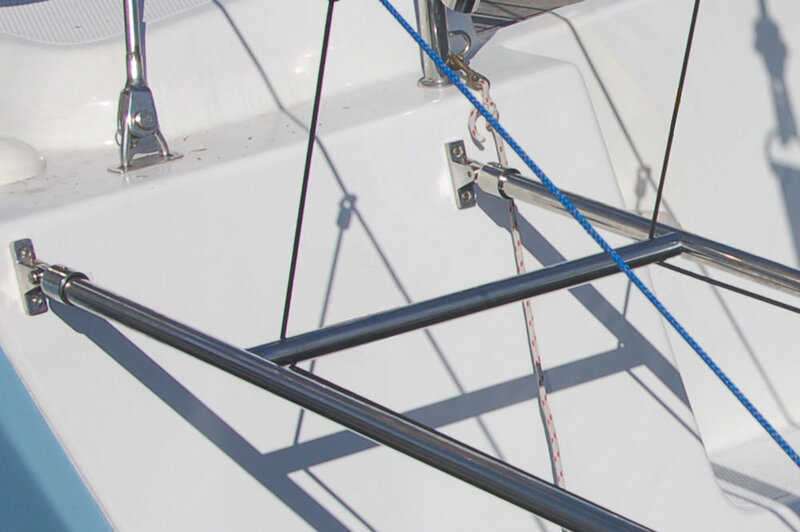 Because the Swing-Lift itself bears very little of the strain of lifting, it is a lightweight and compact design that is easily installed by the boat owner. When not in use, the Swing-Lift takes up very little space, straddling the outboard motor on the ship's railing. "Owen, I want you to know how great it was using our new swing lift for the first time. Installation simple and works just like the video." "Installed and used our swing lift on our 1990 Catalina 28 this month. I just love it, it works like a hot damn. Feel free to use me as a reference. I'm a happy customer!" "Thanks again for getting the unit to me in time it sure made my vacation more enjoyable and in the words of a boater that watched me lift my outboard back onto my stern rail, 'HAY... IT'S NOT SUPPOSED TO BE THAT EASY' "
"We used the "lift" yesterday for the first time. It was fantastic! The captain (me) and the crew were delighted." How to transport an outboard motor between your dinghy and yacht using a halyard and the Swing-Lift. 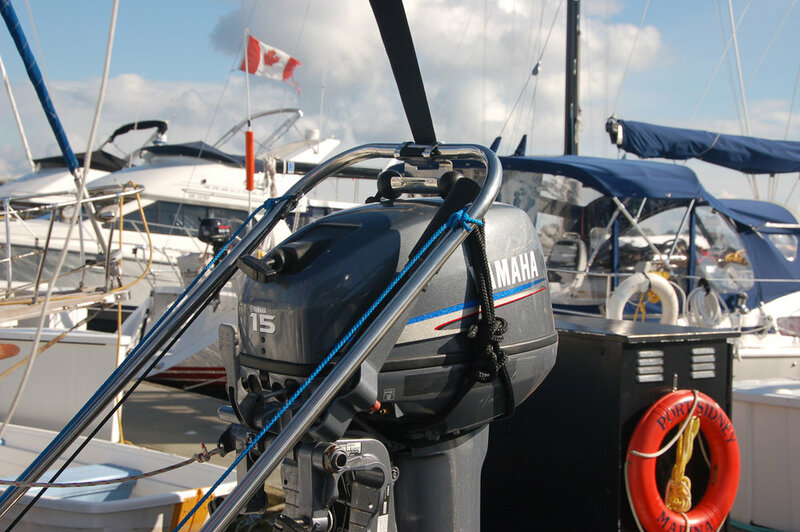 The Swing-Lift works with most commercial harnesses, but we had a hard time finding a harness that fits the variety of outboard shapes and doesn't stretch or slip out of place. Our Sure-Grip harness is a simple solution that can be purchased separately or bundled with the Swing-Lift. The handle location can be adjusted and is locked in place so the motor will remain balanced and secure.